Super Bowl LII is almost here. 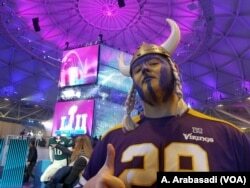 In the week leading up to the biggest sporting event in the United States, the National Football League kicked-off the Super Bowl Experience at the Minnesota Convention Center. Children race at the family-friendly interactive theme park. It's a family-friendly, interactive theme park where fans of all ages can run some of the same football drills as the pros. They kick, pass, catch and run … albeit badly when compared to the players who buckle their chinstraps and put the NFL's multibillion-dollar-a-year product on the field every week of the season. This year's Super Bowl host city is Minneapolis, Minnesota. Its home team - the Vikings - came within one win of playing in the big game. That's still a fresh wound for Vikings fans like Drake Jackson. Thirty-two teams started the season in September, but now only the Philadelphia Eagles and New England Patriots remain. The teams take the field at U.S. Bank Stadium to decide the winner of this year's Vince Lombardi Trophy; the iconic prize awarded to the winner of the NFL's championship game.